Note: This step is only necessary if you have an "Account" in Salesforce that links to the incorrect "Customer" in BluSynergy, typically as a result of an external data import from an external system during first-time setup/migration. 1. 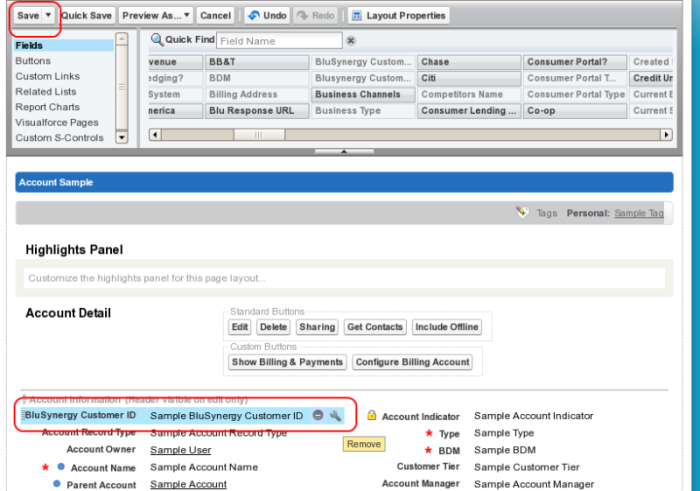 In Salesforce change the default page layout to show the "BluSynergy Customer ID" field. This is usually hidden since it does not need to be editable by non-administrative users. You can get the field to be visible by editing the layout for the account page and dragging the field to the page as in the screenshots below. Note: Depending on your organizations's security configuration, you may have to contact your salesforce administrator if you do not have authorization to edit the page layout. 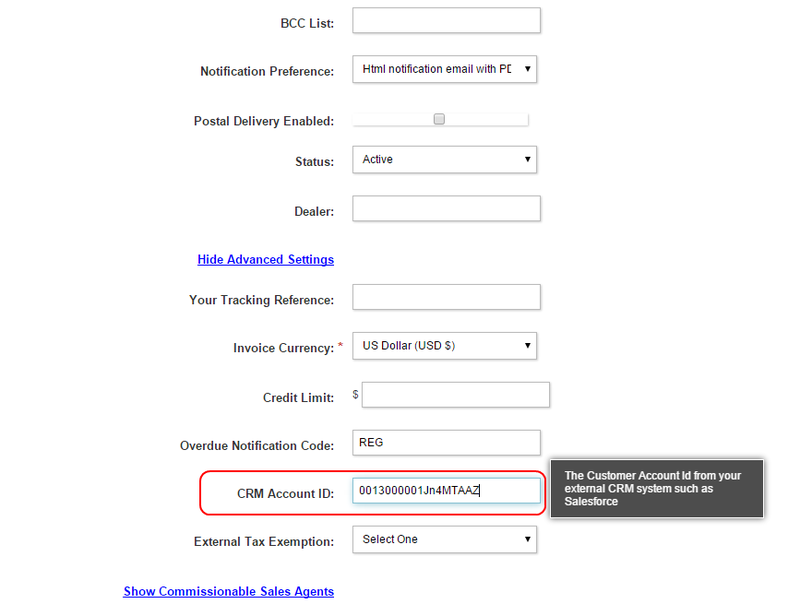 Locate the correct Customer in BluSynergy that corresponds to the correct Account in Salesforce CRM and note the correct identifiers as seen in Fig 4. Finally, update the identifiers as seen in Fig 5. 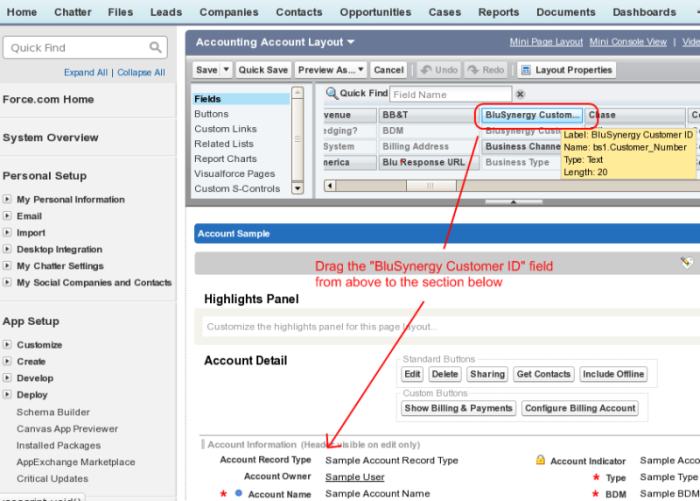 Edit the customer in BluSynergy (by clicking on the green "Edit" button to the right of "BRAD01" in Fig 4.) and scroll down to the "CRM Account ID" field. This should correspond to the Salesforce ID for the Account. 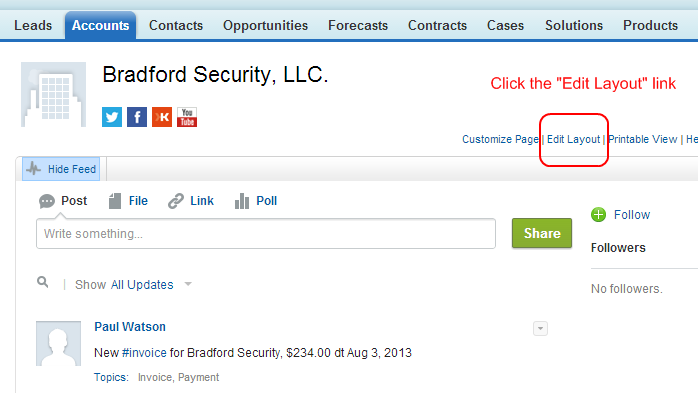 The Salesforce ID may be obtained from the URL in Fig. 5 above or by running a report that shows this column. 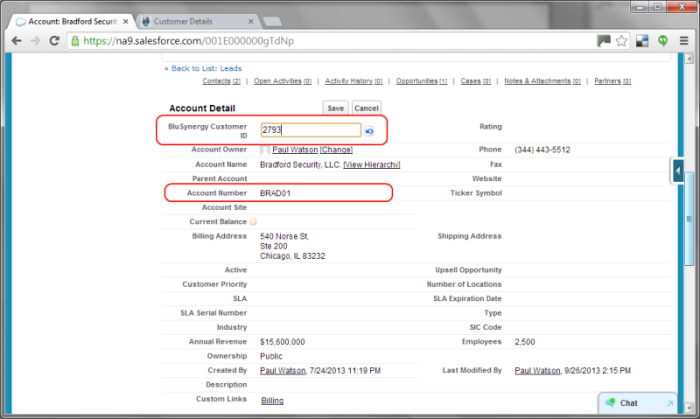 See the Notes section below for information on Salesforce's use of 15 digit vs 18 digit IDs. Once this is done you can click on the link to resynchronize the information between BluSynergy and Salesforce as seen below. After all the updates are complete, you may reverse the changes to the account page layout (from Step 1). Click the link as in Fig. 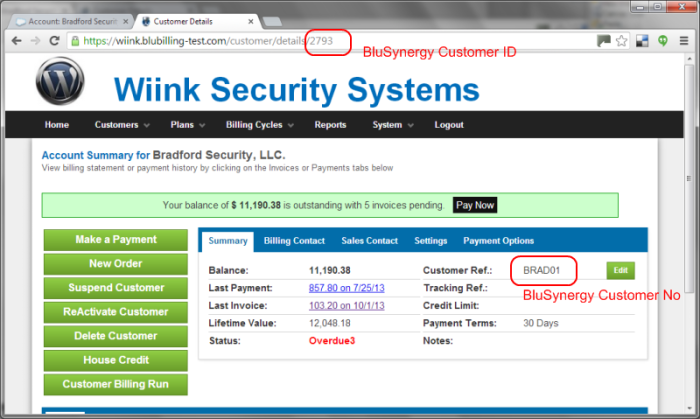 1 and then drag the "BluSynergy Customer ID" field from the page back to the top. Click Save.